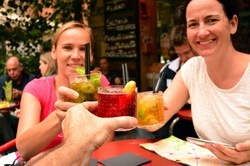 ROME & UMBRIA - Learn to COOK & MEET new international friends! A customised, exclusive, friendly Gourmet Tour to enjoy Italian wonders: just fly to Rome & we arrange a magnificent guided experience with your personal chef ! Wednesday: flight Prague – Rome. Pick-up by private minibus, aperitivo in historic .......and accommodation in family-run agriturismo B&B in ......area. Tasting dinner with sumptuous home-made traditional dishes with local wines. Aftenoon: visit to a .....vineyard to enjoy a selection of local ......, then walk through scenic wine hills to visit ...... a true architectural masterpiece..
Rich home-made dinner at the agriturismo to continue our exploration of the traditional dishes .... . Lunch in the scenic ....dishes and accommodation in family-run agriturismo. - Sunday: free morning for relax and sightseeing, then transfer to Rome airport according to the participants´flight schedules.